It is a chilly evening at the Neil Schiff Tennis Center, and the Miami Hurricanes women’s tennis team is hosting Florida Gulf Coast on a Friday in mid-February. Flags billow in the wind, and players from both teams bundle up in sweatshirts and pants. Temperatures hover around 50 degrees Fahrenheit, a pleasant day for those from the North, yet here in Miami, unexpected and unfamiliar. Hat pulled low over her face, Miami Hurricanes junior tennis player Clementina Riobueno steps toward the baseline and dribbles the ball a few times, mulling over where to place her serve. She decides and sets herself, readying to serve. She tosses the ball into the air and swings exactly at the peak of her toss. The ball screams towards the other side of the court and lands just inside the service line. Her opponent darts towards the center of the court but is a step too slow. Riobueno aces her opponent. Playing in near-historic cold temperatures, Riobueno is warmed up and coming out hot. Her opponent, Florida Gulf Coast’s Briana Stampfli, is not prepared for Riobueno’s bombardment of attacks. Riobueno can out-hit her from the baseline, yet she does not rely on this talent alone. She mixes in serve-and-volley points while also showing an ability to hit aggressively from the baseline and move forward to close out points. Stampfli is no match for her, and Riobueno wins in straight sets 6-3. Success like her victory over Stampfli is not uncommon to Riobueno. The Venezuelan native has created a strong career for herself as a member of the Hurricane tennis team. During her freshman year, Riobueno was named ACC’s Player of the Week on Jan. 29 after going 4-0 in singles and doubles action against No. 56 Hawaii and No. 35 Arizona State. She finished the year 25-4 in singles. As a sophomore, Riobueno was a strong 11-3 in ACC play, while playing at positions three and four. She also defeated North Carolina Tarheel and All-American Caroline Price, a victory she calls “the biggest of my career.” She was a vital member to a Hurricanes team that won an ACC title. Now a junior, Riobueno has greater goals. This season, Riobueno says the team’s sights are set on an NCAA title. Riobueno and her doubles partner Monique Albuquerque rank No. 15 in the nation, and they were the No. 3 doubles duo in the nation during the fall season. 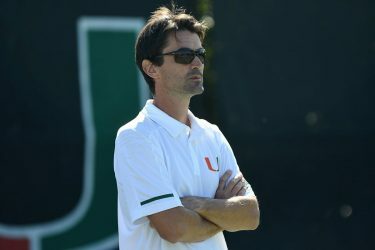 The combination looks to be one that can make a strong run in the NCAA tournament and help Miami defend its ACC title. Like most doubles tandems, Riobueno and Albuquerque bring out qualities in each other that don’t manifest without their partner. Riobueno and Albuquerque have played together ever since Riobueno came to UM, and their chemistry shows on court. In early February, the team knocked off the No. 13 ranked doubles team in the nation. Last year, Riobueno and Albuquerque finished 22-4 – including 10-1 in ACC play – and reached as high as No. 11 in the ITA doubles rankings. Despite her success, Riobueno does not exude overconfidence. She was the No. 1 player in the girls’ 14, 16 and 18 age groups in Venezuela, but Riobueno comes off as a remarkably self-aware and humble young woman. “[The transition to hard courts] was really, really hard, and it’s still hard for me,” Riobueno continued. However, it has not seemed that hard in light of her record at UM. Riobueno is very calm and charming in person, but a very consummate competitor on court. She confidently and authoritatively dictates play against her opponents. 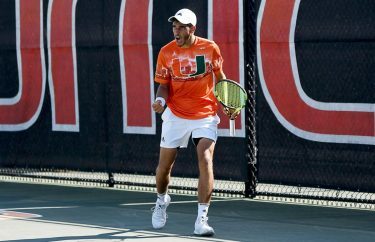 Riobueno and the Hurricanes tennis team started ACC play Friday with a 7-0 win against the No. 53 Wake Forest Demon Deacons. In their quest to defend the ACC title, the Hurricanes takes on the No. 13 Clemson Tigers on Sunday. Miami is currently ranked 20th in the nation.